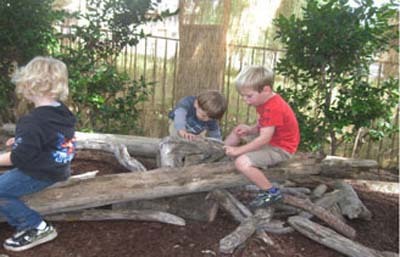 The Ascension Lutheran Early Childhood Center Nature Explore Classroom was developed using the typography of the existing space and by observing where children gravitated for certain learning activities. Existing areas of equipment, trees and landscape were utilized. Dwarf fruit trees were selected for better visibility within the play spaces. 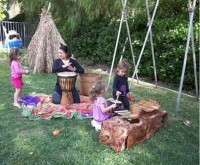 The use of transparent fabric and open structures, such as lean-to and a triangle tunnel were implemented to define the music and dramatic play area. Varying sizes of tree stumps were used to create seating with dwarf trees set behind to create a sense of closeness. Grape vines were planted to grow on fencing for aesthetic and functional purposes. To create a secret path, mulberry trees and dwarf blueberry bushes were planted. 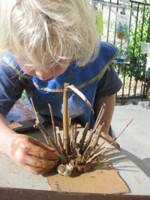 Children are included in planting and tending the garden. Harvesting and eating vegetables from the garden is an enjoyable event that follows. Children are stimulated visually by the vast amount and variety of fruit-bearing dwarf trees and flowers. Plants were chosen so that the children’s play yard is continually in bloom. Textures and smells were also considered in the design. 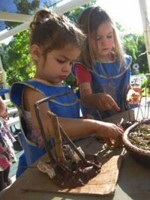 Birdhouses and feeders aid in luring a variety of indigenous birds to the classroom for the children to observe. Wooden closet poles and rope were used to create a triangle tunnel in the classroom. The lean-to music area is made from bamboo poles and is decorated with natural materials which vary depending on what is available and fun. 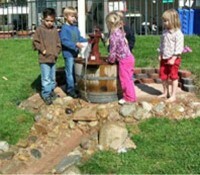 Native river rocks were gathered and used for the creek while an iron water pump allows children to enjoy the essence of water in their classroom. Education about connecting children to nature begins at parent orientation prior to the start of school. A brief overview is given, outlining the school’s philosophy on the importance of connecting children to nature and how everyone can be involved in that process. 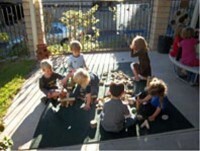 Parents are offered many opportunities to be involved in the ongoing process of creating the outdoor classroom. Through their talent, work, donated materials and expertise, parents have made a huge difference in what Ascension Lutheran is able to offer the children.